It’s been far too long since I last posted an article on this blog, a realisation that has been looming large at the front of my mind for a while now. To be honest, life has been a bit of a rollercoaster over the past few months with one thing or another. Despite my best intentions – I LOVE writing this blog – something had to give, which is why I’ve been quiet for a while. Hopefully, I’m back on track now. 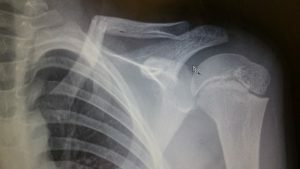 Two weeks before Christmas, my nine-year-old broke his collarbone after being pushed over in the playground (I heard the snap!). Cue a mad dash to A&E to see the extent of the damage. As we were able to see the clavicle poking upwards in an inverted V, it was no surprise to see my son’s X-ray which showed a pretty impressive break. He was sent home in a sling with instructions to take painkillers and return to the fracture clinic two days later. We arrived for our appointment at the children’s fracture clinic as instructed. My goodness, it was packed! Children with slings, bumps, bruises and multi-coloured plaster casts occupied every available space in the massive room. I’ve never seen the place so busy. Despite a previous visit four years ago, we had no idea where to go or what to do. The signs were small, hidden on crammed noticeboards, and occasionally nurses would shrilly call a child’s name over the noise, hoping to be heard amidst the chaos. We dutifully took a seat and waited. And waited. And waited some more. The TV in the corner showed the whole of Puss in Boots and still we had no idea what was happening. Finally, a nurse called out a name that vaguely sounded like my son’s. When I went over to check that she meant us, she snapped out, “We’re running more than two hours’ over, so I don’t have time to get everyone’s name right”. Oh dear. We were then told to take a seat in an already crowded corridor. After another hour, we were finally called into see the consultant. His advice – wear the sling for three weeks, back to PE after five weeks, take painkillers as necessary and sleep on your back. When I asked questions about how the clavicle would reshape and how we could tell it was healing properly or how long my son should sleep on his back, I was told not to worry; I didn’t have to know how things would happen, just that they would. Now, anyone who knows me would have been able to tell that consultant that not understanding how things work doesn’t sit well with me! I like to know what to expect, what to look out for, to understand the healing process. Especially when we’re talking about one of my children. With very few answers, we headed home. Christmas and New Year came and went. My son’s sling came off but we were all worried about how he was healing. The clavicle was noticeably bigger and lumpier, still sticking up at the same angle, and often, when my son moved, a loud grinding noise or cracking sound and a rush of pain would stop him in his tracks. We had no idea whether this was normal. Eventually, after many phone calls, the fracture clinic agreed to see us again. We saw a different consultant and the clinic was altogether quieter, which probably helped his calm demeanour. We went into the appointment and I explained our worries. This consultant took the time to speak to me, answering every question in a clear, concise and completely non-patronising manner. He also encouraged my son to ask questions and answered all of his concerns. Apparently, the lumpy clavicle is great news as it’s new bone growing that will gradually remould into a normal(ish)-shaped collarbone and the grinding noises are just the muscles twanging and pulling over the empty space the bone used to occupy. My mind was immediately put at rest. If only we had known all this in the first place, we’d have known not to worry and that things were working as they should. But what does this have to do with copywriting? Well, that trip to the fracture clinic struck me as a valuable lesson in communication. Customers, whether they’re people in a busy clinic or visitors on a website, don’t want to have to search through clutter to find the information they need. They also want a clear signpost that tells them where to go next. It reminded me that it’s easy to unintentionally patronise people when you’re an authority in your subject, either by not answering your customer’s questions or dismissing them as irrelevant, or by over-complicating the information you provide. The second consultant we saw clearly knew his audience. He understood that parents worry about their children and that they should be informed in detail about the healing process and follow-up care. He understood that people want an idea of timeframes – for example, how long did my son need to sleep on his back? How soon would it be safe for him to go back to swimming? – and that the more informed a person is, the more empowered they are. He recognised that by helping a child to understand what’s happening to them, he can ease their anxiety. The consultant also acknowledged that had we been given this information on our first visit, we wouldn’t have taken up a second appointment and I wouldn’t have spent hours of my time trying to get a second opinion. This reminded me, once again, that as businesses we can best help our customers by listening to them, by answering their questions, by understanding their pain points and by offering a solution, even if that just means giving them reassurance. If we get that right – if we understand who we’re speaking to – then they won’t need to go elsewhere.